You may create a file containing a list of files and folder found on a disk/partition. Then such file may be manually edited to specify files to recover and then loaded back into R-Studio . 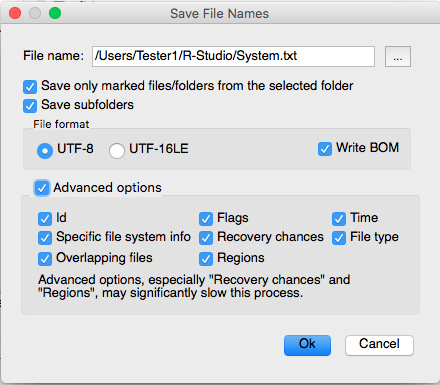 R-Studio will automatically mark the files in this list for recovery. Such file lists recovery are very useful, for example, when it is necessary to have such file lists approved for recovery by someone else who is far away from the computer where R-Studio is running. You may create file recovery lists for the entire disk or for specific folders. Moreover, you may create a file recovery list for all files within the disk/folder, or for marked files/folders only. Control-click the uppermost folder (higher than Root , usually the letter or the name of the disk) and select Save File Names to File on the contextual menu. For a specific folder, control-click the folder and select Save File Names to File on the contextual menu. Specifies the file format in which localized file/folder names will be saved, You may select either the UTF-8 or UTF-16 codepage. Also you may write a special BOM header to the file which helps some text editors to understand which codepage is used. > R-Studio will load the file and mark the files accordingly.